Look at that gorgeous little bow, such a simple but instantly recognisable addition. Whoever came up with that idea at Ciate deserves to be on far more money than everyone else. However, one of my bows on another bottle has come undone and I CAN’T DO IT UP AGAIN! This shouldn’t frustrate me. At the age of 28, wife of 1, mother to 1 and regular tax filer I should be able to rise above this… BUT I CAN’T! Someone with more dexterity than me come round my house and do my bow up for me please, it’s making the bottle look sad and ugly. 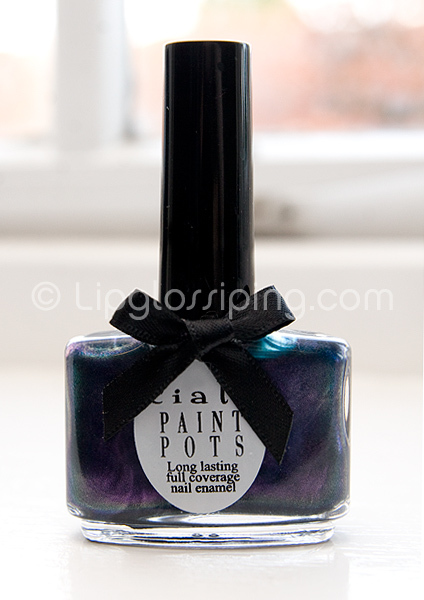 Anyway… look at this shade, a lovely metallic purple-blue combination – stunning! Once applied though (2 coats) – this stuff just lasts and lasts… I’m on day 5 now with minimal tip wear. Very good! Do you have any favourite Ciate shades? I’ve never heard of this brand before. I’ll have to check them out because this color looks fabulous! They’re all very thick and you need to apply them really fast. On the plus side, they dry super fast and wear like iron. I have Shaken Not Stirred on my toes right now – a great blue-toned hot pink. We reviewed a few of them earlier this year if you want to take a look st some others. @Kim – They are expensive I nabbed this off Cosmetic-candy’s blog sale. @Cassie – The bottles are too cute huh? @Helen – I was going to buy a thinner for them, but I’ve never used one before.. all sounds a bit daunting! Hopefully with practise I’ll be able to pick up the pace! Make like Shirley Bassey and bake a Bara Brith!